A Snapshot of activities in the HVAC Industry and Important News and Development at Total Air Services (Vic) Pty Ltd.
Refrigeration and airconditioning - a major player in the economy. Over the last 12 months, Japanese split system air conditioning manufacturers have increasingly been developing air conditioners that will operate on R32 refrigerant with a view to releasing these for sale to the Australian market. In Jan 2013, there were approximately 5 models already registered for sale in Australia. Now, the MEPS website lists 56 models available for sale using R32 refrigerant. (Source www.energyrating.gov.au) It is anticipated that more manufacturers are looking to adopt R32 refrigerant in wall mounted split-system airconditioners where suitable. Dec 2013 - Source Arctick ~ Cool Change. Cold Hard Facts 2 was released recently and presents the most up-to-date findings of a detailed examination of the RAC industry in Australia. It was prepared by Expert Group for The Department of the Environment. The use of RAC equipment makes up almost 22% of all electricity use in Australia. Through proper installation and servicing of RAC equipment, and by ensuring leaks of refrigerant gas are minimised, RAC systems will be able to work more efficiently and effectively. According to the study, right now over 43,000 tonnes of synthetic refrigerant gases (ozone depleting substances and synthetic greenhouse gases) are in use in Australia. That’s approximately 89% of all refrigerant gas currently being used. It is an important figure to remember, as the ARCTick licence is in place to ensure these high global warming potential (GWP) refrigerants are not released into the atmosphere – both now, and into the future. That’s why it’s more important than ever, when it comes to fluorocarbon air conditioning/refrigeration systems, that only ARC-licensed technicians – appropriately qualified to do the job – are legally allowed to install, maintain and decommission these systems. Visit The Department of the Environment’s website at www.environment.gov.au and enter Cold Hard Facts 2 in the search bar to view the report in full. Are you an owner of equipment that contains R22 or an importer or technician dealing with R22? the production and consumption of ozone-depleting substances. This includes a mandatory timeline for the phase out of ozone-depleting substances including almost all imports to Australia of Hydrochlorofluorocarbons (HCFCs),such as R22 by 2016. It is expected that reclamation and recycling will become an increasingly important source of R22 and after 2029, the servicing of the remaining R22-based systems will be entirely dependent on this source. •R22 will continue to be available in Australia, although the quantityof new R22 imported into Australia is reducing. •If your R22 system is in good working order, there is no need to transition to an alternative refrigerant/system. •Regular servicing to minimise leakages is important. •Existing units using R22 can continue to be serviced with R22. •Some used R22 is being reclaimed to manufacturer’s specifications. Contact your refrigerant supplier for further information. •Conversion of your existing system to use a non-ozone-depleting substitute refrigerant. Where conversion is being contemplated, you should seek the appropriate advice, including whether the substitute refrigerant is appropriate for that type of use and to ensure that you comply with all the relevant legislation and Australian Standards. •Delaying equipment replacement where applicable may mean thatwhen you do replace your equipment, alternative technology using low GWP refrigerant may be more readily available and established. Equipment manufacturers, gas suppliers, refrigeration engineers, technicians and state and territory work health safety regulators can provide advice on equipment and refrigerant issues, warranties and safety requirements for your particular circumstances. Sept 2013 - Source Arctick ~ Cool Change. Total Air Services (Vic) Pty Ltd has been awarded the successful contractor to provide Mechanical Maintenance, breakdown works and upgrades for Brimbank City Council. Our Value for money approach coupled with our professional personal service has seen Total Air Services (Vic) Pty Ltd be awarded this tender. Total Air Services (Vic) Pty Ltd welcomes Brimbank City Council andtheir 89 facilities and buildings into our Preventative Mechanical Maintenance portfolio. 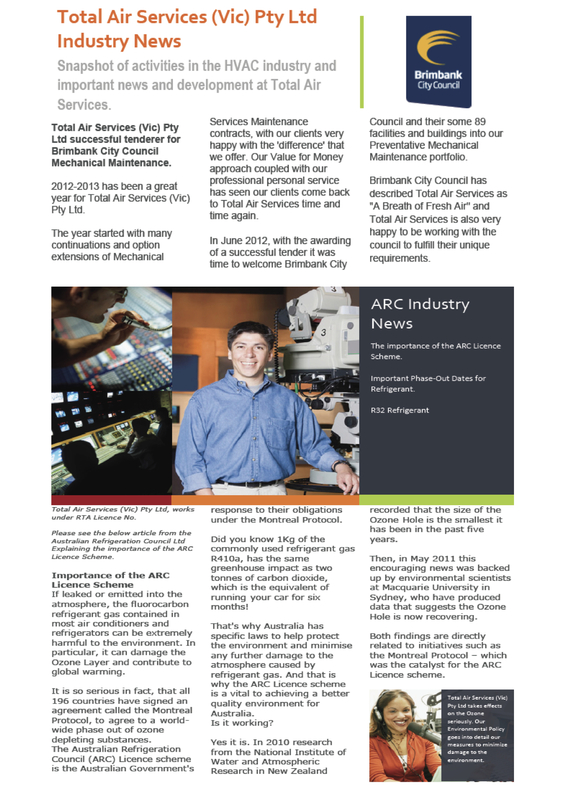 Brimbank City Council has described Total Air Services as "A Breath of Fresh Air" and Total Air Services is also very happy to be working with the council to fullfill their unique requirements.